Divorce, bereavement, losing your job, wedding planning, work, family, debt, commuting, studying for exams and pregnancy. Those are the so-called top ten life stressors, but it makes me wonder what’s left. According to that list, it’s probably only when we’re deeply asleep that we won’t experience stress, and even that’s only providing we don’t get nightmares. So maybe a different attitude to stress is needed ~ a more holistic approach which cognitively embraces stress as necessary to life, but one which takes in the need for therapeutic techniques to maintain balance. After all, we wouldn’t want to avoid many of the events on that list as they are what make our lives worthwhile. But part of the problem today is that human beings have not evolved sufficiently to cope with the amount of stress that they’re faced with. 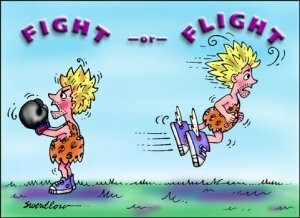 This is because of a physiological reaction which biologists discovered in the 1930s — a mechanism known as the ‘fight or flight response’. 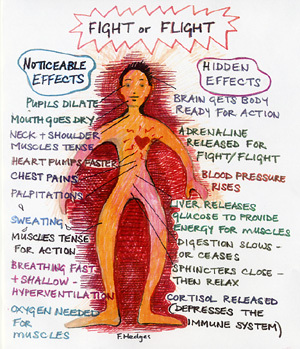 The ‘fight or flight response’ is a process of the nervous system which is connected to our more primitive, limbic brain. It comes from when we led a less sedentary lifestyle and may have had to cope with greater dangers in the wild. 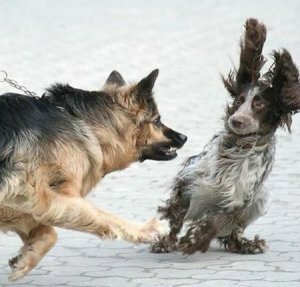 Basically, the ‘fight or fight response’ snaps into action at the first sign of danger or threat, and it causes the body to go through some very fast physiological changes in order to provide us with the strength and energy to stand and fight, or else to use that increased potency to make ourselves scarce and fast. •	skin goes alternately pale and red, as the blood vessels constrict. •	tear glands are inhibited, and pupils dilate. But because we now so often undergo the ‘fight or flight response’ not in the forest or the wilderness, but in the office, shop or boardroom, and because it would be inappropriate to respond by fighting or fleeing, we’re often left with its residual chemicals floating uselessly around in our bodies. After all, it really wouldn’t do to stand and fight the managing director — there are laws about that kind of thing! — or even to flee a difficult meeting. Sometimes, we can’t flee — for instance, if we’re trapped on the Tube in the rush hour and the person next to us has body odour. We just have to grit our teeth and bear it. It’s mainly for those reasons that stress has become such a problem in our society. Interestingly, it’s been found that there is a marked increase in the performance of the immune system soon after the ‘fight or flight response’ has been acted upon. Conversely, an unfulfilled ‘fight or flight’ opportunity can lead to a reduce immune capacity, and this can lead to all sorts of problems such as susceptibility to viruses and infections. Other physical problems that can develop include constipation, anorexia, erectile dysfunction, difficulty urinating, and also impotency. Typical psychological responses to stressors are addiction problems, sleep disruption and an inability to maintain healthy social relationships with others, sometimes to the point of complete withdrawal. As holistic health practitioners, we notice where stress takes its toll on the body, especially in the back, the part of of us which tends to hold most of our unexpressed emotions, frustrations or fears. Various kinds of massage help — such as Deep Tissue Massage, Lomi Lomi Massage and even Aromatherapy, where the negative emotions can be healed by specific floral aromas which we custom blend to suit the body-mind-spirit of the individual client. Another great therapy which we use to unblock these stuck energies is Craniosacral Therapy because it’s so good at getting the body to relax. But perhaps our most popular stressbuster is the luxury two to two-and-a-half-hour massage. We call it Head to Toe: Total De-stress, because, during it, the whole body is nurtured from top-to-toe and a deep meditative state is induced through relaxing music, hot towels and scented oils. For more about these de-stressing treatments, please check out our Therapies page.